The success of your roof replacement project not only depends on the materials used, but also on the workmanship provided. That’s why you should only work with a reputable, honest and efficient contractor. One of the smartest decisions you can make is to hire a GAF Master Elite roofing contractor. When you choose us for your roof maintenance needs, you’ll be working with one of the best roofers in the industry. Since we are up-to-date with the latest trends and installation methods, we won’t commit mistakes. We know how to make your project go as smoothly as possible. Our rich industry experience also lets us recommend the perfect products for your specific needs. 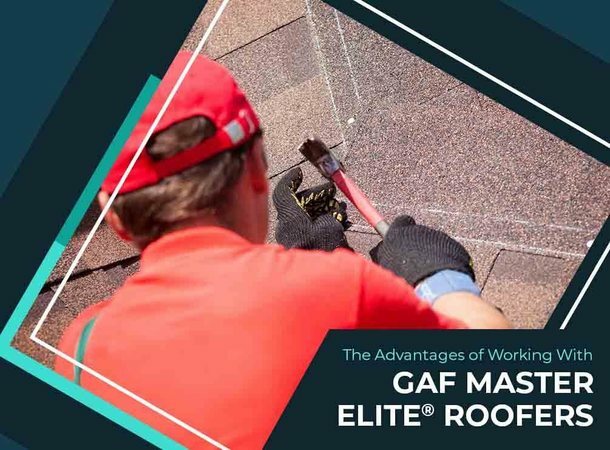 As a certified roofing and gutter contractor, we are trained to install, repair and maintain GAF’s entire product line, allowing us to provide you with the brand’s wide variety of asphalt shingles. You’ll easily be able to find the right colors, designs and features to match your home’s specifications. We can also offer the brand’s Lifetime Roofing System, which comprises high-performance components working together to stand the test of time. In turn, you can keep your home safe, dry and damage-free for years to come. Thanks to our distinction, we can back your new roof with one of the strongest warranties available: the Golden Pledge®. This is GAF’s best warranty, which has a 100% coverage period for material defects that lasts up to 50 years. It’s also one of the few warranties to have a 100% coverage period for workmanship that lasts up to 25 years. The brand even includes the tear-off costs and disposal costs, for your peace of mind. As your premier roofing and siding contractor, we have what it takes to carry your project to perfection. Call us now at (865) 268-4237 to learn more about our products and services. We serve Knoxville and nearby areas in TN.